If you are looking for the best pricing on smaller foam core boards, then consider buying in bulk! We sell full boxes of foam mounting board in several different sizes at unbelievable prices. Depending on the size, boxes may contain between 10 and 50 boards. Plus we have so many different kinds of mounting boards available, that you are sure to find the perfect style for your specific requirements. 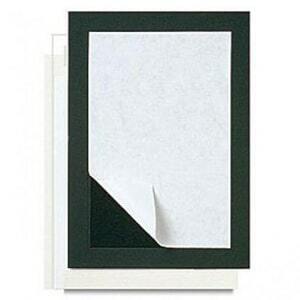 Choose from plain foam board, self-adhesive boards, or heat-activated mounting sheets. You can also choose either standard foam core board, exceptionally durable gator mounting boards, corrugated plastic boards, pouch mounting boards, and self-stick mat boards. Click the style below to see the available sizes and colors, as well as to see our low pricing. Bonus Tip: If you need several boxes, be sure to call us and ask for a quantity discount to save you even more! We will do our best to beat anyone else's pricing, without sacrificing quality. 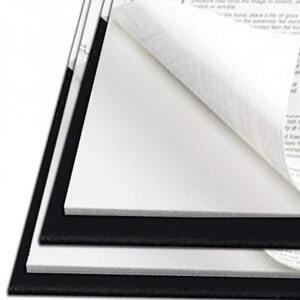 Our most popular sizes include the smaller foam boards, typically in the 20" x 30" and 24" x 36" range. But you can expect the same great prices for all of our mounting board sizes, which come in sizes up to as large as 60" x 120". Now let's learn more about each of these board options! Because when one person thinks of a foam board, they may be envisioning plain solid boards, whereas someone else (such as printers or sign makers) may think of heat activated boards instead. Plain Mounting Boards: We offer plain mounting boards in both foam board and gator board materials, as well as a huge variety of sizes from as small as 20" x 30" up to as large as 60" x 120", and in either black or white. The word "plain" describes the fact that these mounting boards do not feature any adhesive coating on them, so they are used as general purpose mount boards with no limitations as far as application goes. We also offer a variety of mounting adhesives including pressure sensitive and heat activated options to meet almost any demand. Choose from either plain foam board or plain gator board options. Foam board is the most popular choice and is the basic foam core board that is used for general applications such as presentations, school displays and projects, poster and print mounting, and more. The surface of the foam boards is clay coated and surrounds a lightweight polystyrene center, offering a stable and rigid board. They are available in sizes from 20" x 30" to 48" x 96", and measure standard 3/16" thick. 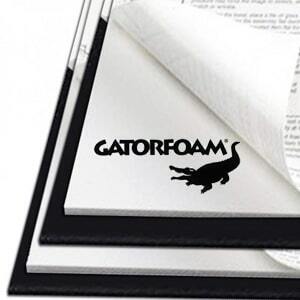 Plain Gatorfoam gator board, however, is a presentation board that is especially resistant to dents and punctures. 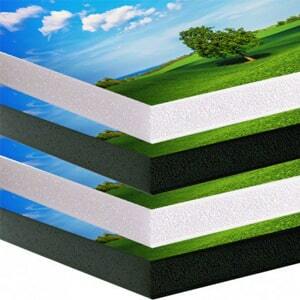 It features hard Luxcell surfaces surrounding a lightweight polystyrene foam core. Ideal for photo mounters, artists, designers, sign painters, exhibit builders, and engineers that need a durable board that will last being handled often and be more stable. Gator boards are available in sizes from 24" x 36" up to 60' x 120". Most sizes are 3/16" thick, but the 48" x 96" option is also available in 1/2", 3/4", and 1" thick options. Self-Adhesive Foam Boards: With self adhesive mounting boards you can create displays quickly and easily, without the need for heat or any required special equipment. Optional mounting machines for cold / pressure sensitive boards are available, and are recommended when working with extra large boards and prints. Otherwise, professional mounting can be accomplished with just one of these self-stick mounting boards, a print of your choice, and a brayer hand roller. It is so simple to mount prints to foam boards with these adhesive foam boards. Just peel pack a corner of the liner, center your print on the board and press it onto the exposed adhesive. Then peel back the rest of the liner while using a hand roller to adhere your print to the board from corner to corner, and center to edges. Using a roller is important to remove the bubbles and help avoid creases. Self adhesive mounting boards are made of traditional foam core boars, which features a durable but lightweight polystyrene core with with clay coated facing. They are available to buy in a huge selection of sizes from as small as 8" x 10" up to as large as 48" x 96", and in black or white. Some sizes also come with either one-side or two-side adhesive. All boards are the traditional 3/16" thick. They are a popular display solution for photo studios, personal artists, trade show organizers and companies, and so many more. Heat-Activated Mounting Boards: Used primarily by professional print shops, these heat activated mounting boards offer a premium solution for print mounting needs. They feature an adhesive on one side that is activated when ran through a heated mounting machine or roll laminator that is rated for mounting. The specially formulated adhesive is of high-quality, and ensures consistent and even bonding for a clean and smooth finish. The one-step run through your laminator saves time and money by eliminating the extra step of having to add adhesive to your print. Heat activated mounting boards are available to buy online in either standard foam core or a more durable gator board option. 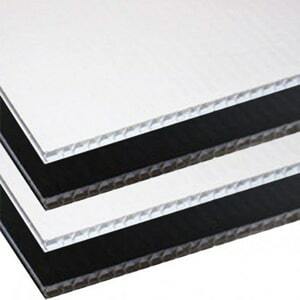 Heat activated foam board is the most popular option, as it is made of a general purpose foam core with clay coated facings. The core is made of a lightweight polystyrene, offering a stable and rigid display. 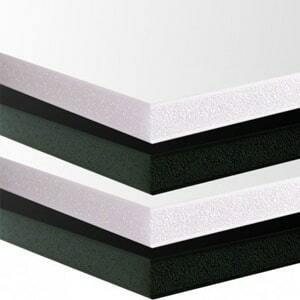 Foam mounting boards are available in sizes from 8 ½" x 11" to 48" x 96", and measure standard 3/16" thick. Heat activated gatorfoam gator board is a more durable option that is much more resistant to dents. The surface is made of hard Luxcell with a lightweight polystyrene core making them easy to transport. These boards can be handled more frequently and roughly, resisting damage for a longer-lasing display. Gator mounting boards come in sizes from 24" x 36" up to 48" x 96" and are 3/16" thick. No matter what you decide, when you buy heat activated mounting boards online, you get a quality product that can help you produce premium photo prints, posters, signs, and more. Corrugated Plastic Boards: Corrugated plastic boards are used primarily for outdoor signs because of the durable plastic board material that can withstand outdoor weather for much longer than traditional mounting boards. They feature vertical fluting for the core, which makes for easy attaching to stake sign holders and other board stands and hangers, and a durable facing. They are available in either portrait or landscape styles. Because they do not have any pre-applied adhesive on the facings, you can use them with any pressure sensitive or heat activated mounting adhesive to attach your print. This allows for complete versatility of application and means that expensive mounting equipment is not a requirement. Perfect for outdoor signage and promotional advertisement displays of many kinds, plain corrugated plastic boards are 4mm thick and come in a variety of sizes from as small as 12" x 18" to as large as 24" x 36". The first dimension listed is the width of the board, or the side with the holes. All sizes are packaged with 10 boards per box. Self-Stick Gator Boards: Self stick gator boards are like traditional self stick foam boards, however, feature a stronger, more stable core that makes them ideal for the longest-lasting display possible. The simple peel-and-stick mountability of these boards makes them extremely easy to use, ideal for smaller businesses that don't have heavy duty or heated laminating / mounting equipment. 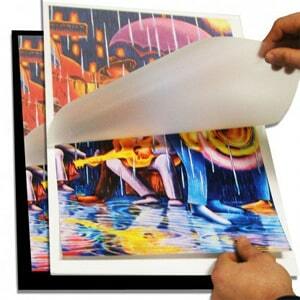 They can be used with a mounting machine, and can also be done by hand or by using a roller. Just peel the liner and press on your print. When you buy self adhesive gator mounting boards online, you are investing in the most durable cold mount board available, sturdy enough for use at trade shows or as signs in high-traffic areas. Pouch Boards: With pouch mounting boards you can turn a standard printout into a professionally mounted work of art in just one step. Whether you choose our heat activated pouch boards or self-adhesive pouch boards, these unique mounting boards will mount and laminate your prints in one simple step. Simple place your print under the attached laminate sheet and either run it through a mounting machine (for heat activated adhesive and large pressure sensitive prints) or use a brayer hand roller (for smaller pressure sensitive prints) to mount and laminate. Depending on what you choose, the packaged quantity varies. In addition to being available with different kinds of adhesives, we also offer a variety of mounting board types. Basic foam board pouch boards are the most popular option, and offers a great general-purpose mounting opportunities with the foam-core and durable facings. They come in the largest variety of sizes, ranging from 8 ½" x 11 ½" up to 41" x 61", and also come in black or white and with gloss, matte, or luster finish laminate sheets attached. The gloss laminate is the most common and will enhance your colors and contrast, while the matted and luster options offer a softer look than can help reduce glare and offer a more unique finish. Gator pouch boards offer a heavier duty solution that is more resistant to dents, cuts, and punctures. These heavy duty boards have a hard Luxcell surface and are most popular for professional photo mounters and artists, exhibit builders, engineers, and anyone else who needs a board that can withstand heavy handling and offer a premium finish. Gator pouch boards come in either black or white, are available in sizes from 18" x 24 ½" to 36" x 48", can be purchased with heat activated or pressure sensitive adhesive, and with either a gloss or matte laminate sheet. Pouch boards are also available in corrugated plastic sheets, which feature vertical fluting and an extremely durable plastic material that makes them a great choice for signs such as those for political campaigns, outdoor advertising for retail shops, and so much more. Corrugated pouch boards are only available in white with a pressure sensitive adhesive, and come in sizes from 18 ½" x 12" to 36 ½" x 24" with a gloss laminate sheet. With the flutes running vertically, the first dimension listed is the width and the second is the height of the board. Lastly, you can buy pouch boards online in a paper board option, which offers a thinner and more flexible solution. Paper pouch boards are 25 mil thick and come with a heat activated adhesive that is low-temperature, so may be safe to use with your heat sensitive inkjet prints. Sizes available include 18 ½" x 25" to 25" x 37", and they come with a gloss laminate. These unique paper pouch boards are rigid enough to stand on an easel for display, but thin enough that transporting several pieces at a time is easy. Self-Stick Mat Boards: Self-stick pre-cut mount boards are made of a 1/16" standard mat board, but feature a unique adhesive center that allows you to mount photos, point of purchase displays, and more with just the press of your hands. The adhesive is self-stick, which is also called pressure sensitive or cold adhesive, meaning that all you have to do is peel off the liner and press your print down to achieve a professionally finished mount. These unique self adhesive mat boards are popular for framers and photography studios to create on-demand orders fast and efficiently, without the hassle of hand-trimming mats, as well as retail stores who want to create counter top displays that have a bold border to draw attention to the mounted image (pair with self stick easel backs to make a stand-up display). Sold in small boxes of just 10 pieces means these mounting boards are also popular for at-home users and artists who want to be able to create affordable, but professional, mounted image prints. You can even see these mat boards on the Tonight Show where they highlight articles. These self-stick mat board mounting boards come in several sizes to fit into common frame sizes and to work with popular print sizes. The adhesive center is slightly smaller than the print itself so it is more forgiving to slightly mis-aligned print applications. Sometimes called CenterMount "instant mat" boards, they come in several different colors, including traditional black and an antiqued white, as well as gray and even crimson deep red in some sizes.